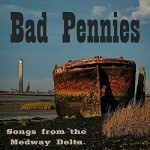 Share the post "Album review: BAD PENNIES – Songs From The Medway Delta"
In many ways the Bad Pennies’ ‘Songs from The Medway Delta’ is a snap shot of the high standard of rocking blues that used to fill the nation’s pub and club music circuit. But much like the album’s arresting art work of rusty weathered boats beached on dry land, ‘Songs From The Medway Delta’ is a musical a metaphor for familiar rock-blues template that struggles to survive without the oxygen of venues and publicity. Undeterred, Bad Pennies employ a new wine in old bottles approach, in which 14 tracks provide a solid framework for a rock-blues format that takes in related musical influences such as booming shuffles, tight funk, exuberant boogie and hi-octane rhythm & blues. There’s certainly provide enough variety to forge their own style on an album that works hard to engage the listener. They are at their best on tub thumping shuffles such as the opening ‘Crash & Burn’, and the dynamic ‘Mynah Bird’, on which vocalist Adam Stocker delivers one of his best vocals on a song that cleverly works the dynamic. They slip into the drum tight, wah wah-led funk of ‘Lady Luck’, and the more understated rhythmic work of ‘Walk Away’, complete with an unlikely tempo change that emphasizes Gary Seager’s jangly guitar work. They contemporise core rock-blues elements in a wide ranging musical landscape. It’s all glued together by a self confident, road tested combo whose mission is clearly to nail a signature style with their own material. They do so in part, on an album that flickers rather than burns. At their best, they sparkle with rip-roaring blues-rock, but on the less frenetic numbers, they display a curious circumspection that a producer would surely have smoothed away. In short, they don’t always emulate what they set out to achieve. Both ‘Walk Away’ and ‘One Shot (Ballad Of A No Good)’ for example, are slightly hampered by Stocker’s tendency to over-sing. ‘AM Blues’ also nearly runs out of steam, before being counter-weighted by a well placed guitar solo that ultimately adds little to the song as a whole. It’s an example of a good idea not being fully realised. On the upside, the band’s inherent drive comes from the impressive rhythm section of bassist Gavin Matthews and drummer Dave Two Jackets, who know when to rock, swing and groove. ‘Medicine Man’ for example, finds Two Jackets anchoring a spoken word number with gentle brush strokes, while Seager’s country blues harp adds emotional colour. ‘When I Get Drunk’ aims for a quasi New Orleans feel, on a stop-time number that builds up a tension that is never quite resolved, as it simply runs out of steam. They rock hard on ‘Queen of all the City’, though a lack of a warm guitar tone robs them of maximum impact. ‘Midnight Train’ is much better, and finds the band at their explosive best on a song that would easily fit into an Eddie & The Hot Rod set, while ‘Temperance Boogie’ confirms their road tested frisson. This entry was posted in ALBUM REVIEWS, ALBUM REVIEWS (Mobile), All Posts and tagged Adam Stocker, album, Bad Pennies, blues, boogie, Dave Two Jackets, Eddie & The Hot Rods, funk, Gary Seager, Gavin Matthews, R&B, review, rock, Songs From The Medway Delta. Bookmark the permalink.